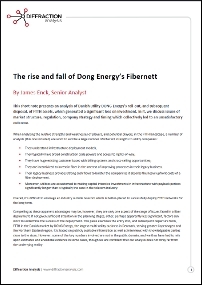 In the report The Rise and Fall of Dong Energy’s Fibernett, James Enck explores the failure of the largest Danish utility FTTH network. Quite often, case studies concern themselves with success stories, but we believe that understanding failures is just as important if not more important! This short note presents an analysis of Danish utility DONG Energy’s roll-out of FTTH assets, and subsequent disposal, which generated a significant loss on investment. In it, we discuss issues of market structure, regulation, company strategy and timing, which collectively led to an unsatisfactory outcome. The findings of this report should provide valuable inputs for service providers trying to make it in the FTTH space, utilities looking at or focusing on a fiber network investment, and policy makers and investors trying to understand the pitfalls of NGA deployment.